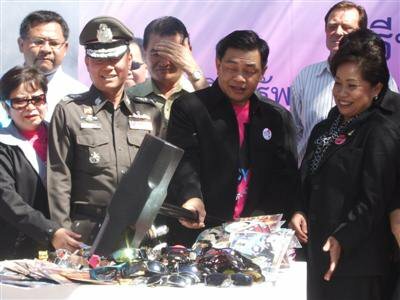 PHUKET TOWN: The Intellectual Property Department and Phuket Provincial Police on Monday destroyed over 200,000 counterfeit products valued at 43 million baht. The event, intended to show Thailand is serious about enforcing intellectual property laws, was held at the solid waste incinerator at Sapan Hin. Taking part were the Phuket Provincial Police, Department of Intellectual Property, Phuket Office of Commercial Affairs and Phuket City Municipality. Deputy Commerce Minister Alongkorn Ponlaboot said the ceremony should help increase awareness of the need to ‘just say no’ to counterfeit products among Thai consumers and tourists. Named the ‘Destruction of Confiscated Pirated Products Ceremony’ by its organizers, the event was attended by local dignitaries including Phuket Governor Wichai Phraisa-ngop, Phuket Police Commander Pekad Tantipong and party list MP Chalermlak Kebsup, whose business interests include real estate holdings in Patong. All enjoyed a laugh while smashing counterfeit items with an oversize hammer. Mr Alongkorn also climbed into a front-end loader to destroy a large pile of confiscated counterfeit goods, all of which were then incinerated. The goods included textiles, bags, watches, sunglasses and many other items popular with tourists which were seized in multi-agency operations from January to October last year. During that period, the Department of Intellectual Property reported 6,731 cases of intellectual property rights infringement and seized 5.03 million illegal items nationwide, up 75 percent from the same period in 2008. The increase was due to better enforcement of anti-piracy laws, Minister Alongkorn said. “This year we expect a one hundred percent increase in the arrest rate,” he said. “I believe with government support we can improve the situation and protect producers’ intellectual property rights,” he said. More border control operations to stop pirated goods from entering the country are also needed because the trade costs Thailand a great deal in lost import taxes from legitimate goods, he said. “Pirated products are a stain on the beauty of Phuket. The Pearl of the Andaman should be unblemished,” he said. After the ceremony at Sapan Hin, Mr Alongkorn joined a ‘Say No to Piracy’ walking campaign in Patong, which is infamous for the trade in counterfeit goods.